At the last moment, editor Molly O'Neill is unable to attend, but we have a wonderful editor from the same imprint jumping into our Summer Conference dance. Add to that, this editor is also an author who has insights from both sides of the creative and publishing process! 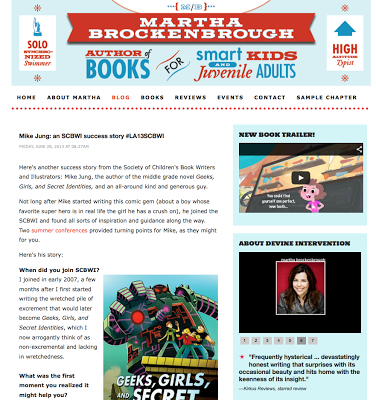 Claudia Gabel is an Executive Editor at Katherine Tegen Books, an imprint of HarperCollins Children’s Books, acquiring and developing middle grade and teen fiction in a variety of genres. Her most recent titles include Mila 2.0 by Debra Driza, Gravediggers: Mountain of Bones by Christopher Krovatin, Hemlock by Kathleen Peacock, Pretty Crooked by Elisa Ludwig, and The Ward by Jordana Frankel. She is also the author of the tween series In or Out, the mash-up novel Romeo & Juliet & Vampires, and coauthor of the forthcoming contemporary sci-fi novel Elusion with Cheryl Klam. She lives in New York City. Romeo & Juliet & Vampires? I can't wait to hear her speak! The 2013 SCBWI Summer Conference (#LA13SCBWI) Is Officially Sold Out! If you're joining us in person or just following along virtually, make sure to keep checking back here at the Conference Blog for all the latest updates and live blogging from the conference floor. You can also search twitter for the #la13scbwi hashtag, even if you don't have a twitter account. The conference begins this Friday, August 2, 2013 - and it's going to be amazing! 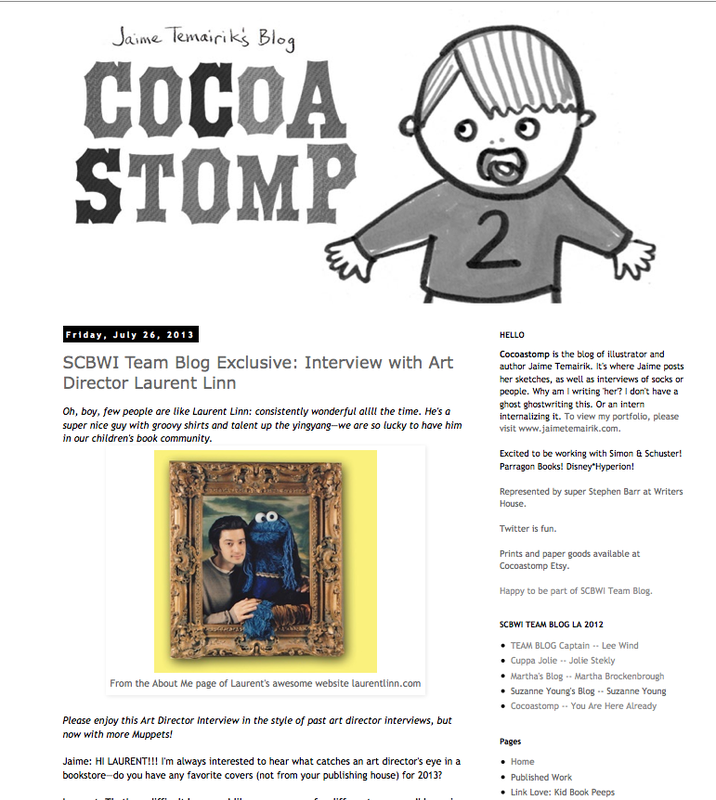 To attend Laurent's Saturday afternoon workshop, "Rethinking the Rules of Being an Illustrator," and his Sunday morning workshop with Leeza Hernandez, "The Collaboration Between Art Director and Illustrator," you'll need to join us at the 2013 SCBWI Summer Conference. There are still a few spaces left... Details and registration information are here. 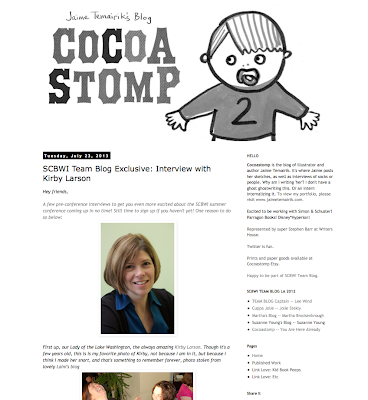 Team Blogger Jaime Temairik did this wonderful interview with Kirby Larson about blogging (and how Kirby re-invented her own blog), how Kirby's dog helps her write (! ), and how a SCBWI conference both inspired her and gave her that first big break into the industry. To hear Kirby's Saturday morning keynote, "Where's Papa Going with that Ax? Whispers of the Past in Contemporary Middle Grade Novels" and attend her Sunday workshop, "Get a Life: Using Figurative Language To Create Character," you'll have to join us at the 2013 SCBWI Summer Conference, August 2-5, 2013. There are still a few spaces left. You can find details and registration information here. 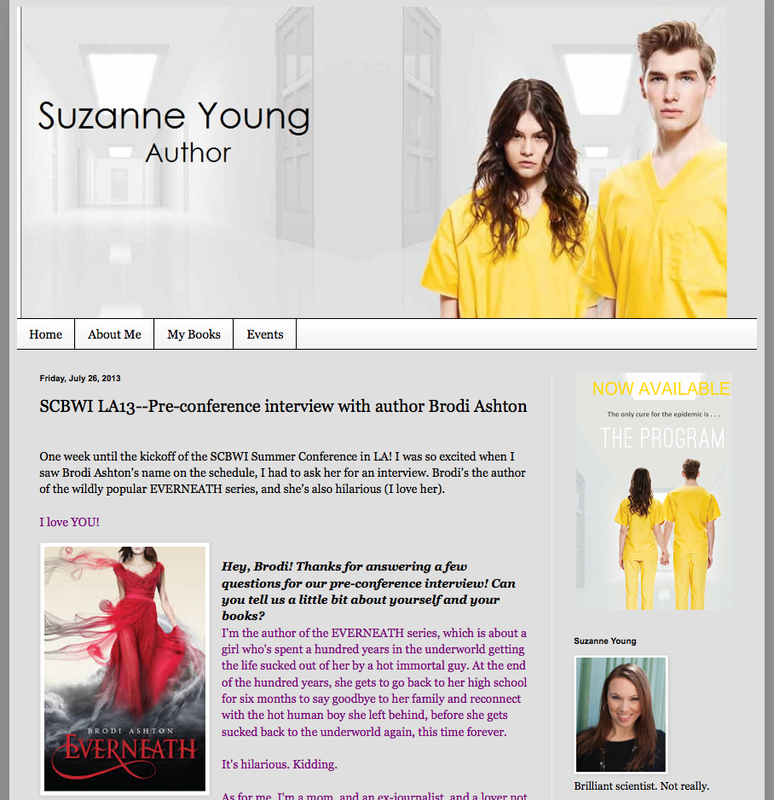 Check out this very funny interview with Brodi Ashton by Team Blog's Suzanne Young. 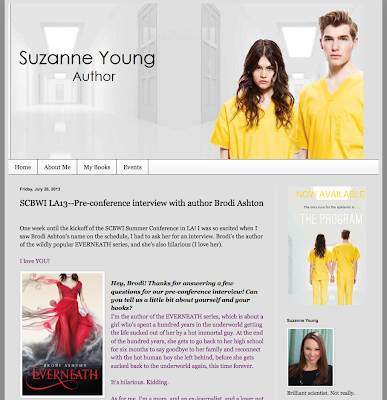 They talk about Brodi's EVERNEATH series, what her world building workshop won't be about (I told you it was funny!) and what a new writer could gain from attending a SCBWI conference. If you want to hear Brodi in person, and be part of all the craft, business, opportunity, inspiration and community that the SCBWI Summer Conference offers, you'll have to join us in Los Angeles August 2-5, 2013. There's only a few spaces left - go here for all the details and to register. Join us at the 2013 SCBWI Summer Conference in Los Angeles, August 2-5, 2013, and avail yourself of all the craft, business, inspiration, opportunity and community the SCBWI Summer Conference offers! There are only a few spaces left - details and registration are here. Sarah Towle’s debut storyapp, Beware Madame La Guillotine, A Revolutionary Tour Of Paris, launched in July 2011 to rave reviews and went on to earn a spot on three Top 10 App lists! 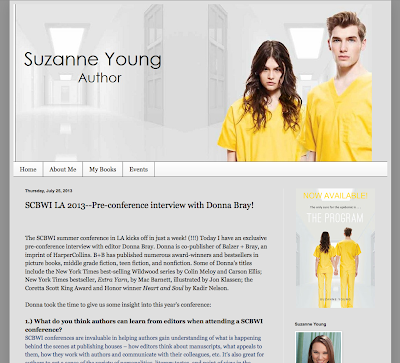 She'll be on faculty at the upcoming 2013 SCBWI Summer Conference, August 2-5, 2013 in Los Angeles. 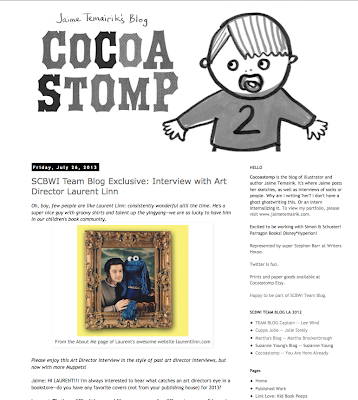 I caught up with Sarah and in our interview got her to share about her remarkable storyapp, how it evolved into its current form, her take on publishing's digital revolution, and even the coolest French Revolution fact she learned while doing all her research! To attend Sarah's workshop (co-led by Julie Hedlund), "Picture Books and Story Book Apps: Same, Same but Quite Different," and partake of all the craft, business, inspiration, opportunity and community the SCBWI Summer Conference offers, you'll have to join us. 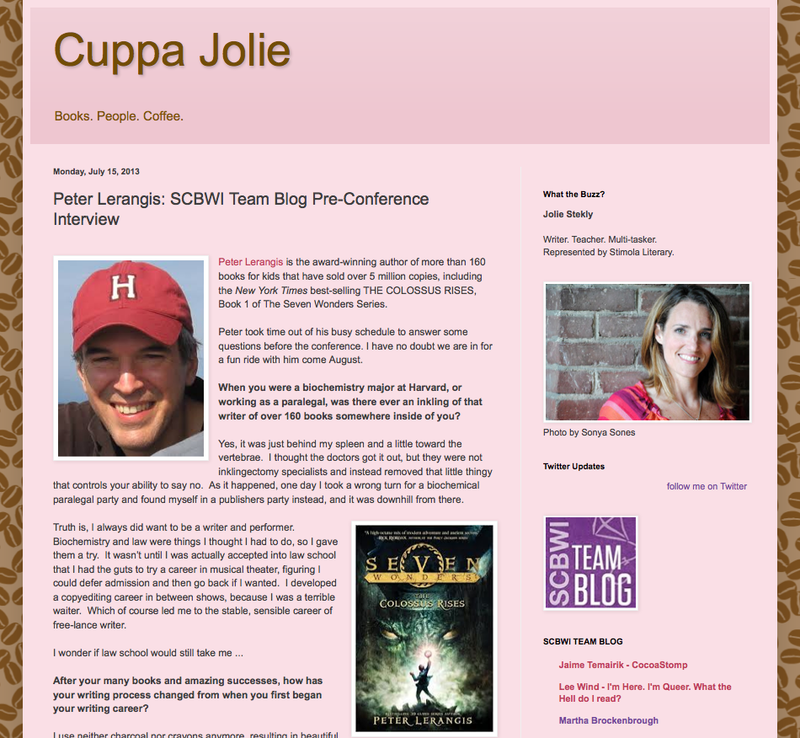 Team Blogger Jolie Stekly interviews award-winning author and conference faculty member Peter Lerangis (over 160 books, 5 million copies sold!) as we gather momentum toward the 2013 SCBWI Summer Conference, coming up this August 2-5, 2013. Peter will be giving a Friday morning PROtrack workshop on "Genre Switching," a Friday Keynote, "Taking the 'Middle' Out of Middle Grade Fiction: A Writer's Manifesto" and a Saturday morning workshop "Getting Serious With Series." 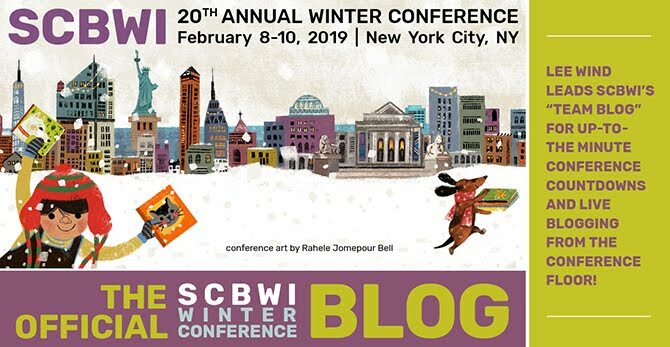 To see Peter in person and partake of all the craft, business, inspiration, opportunity and community the SCBWI Summer Conference offers, you'll need to join us. There are only a few spaces left - you can get all the details and still register here. Team Blogger Martha Brockenbrough continues her series on children's book writers and illustrators with SCBWI success stories! 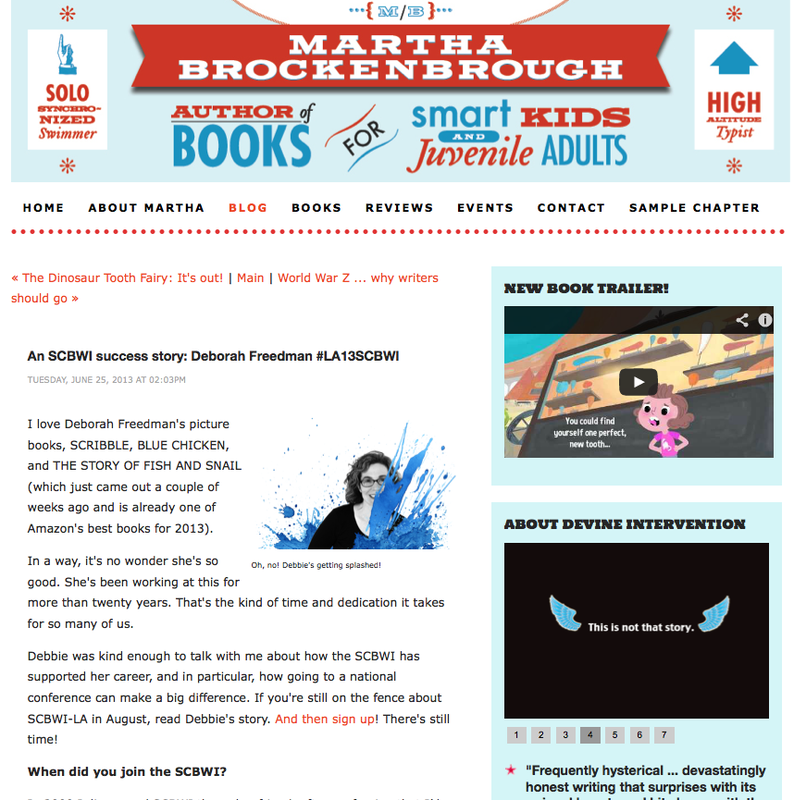 Here Martha interviews Author/Illustrator Deborah Freedman about how SCBWI made a difference in Deborah's career - including the breakthrough that happened through attending a SCBWI Conference! There are still a few spots left for this Summer's SCBWI Conference in Los Angeles, August 2-5, 2013. You can find out all the details and register here. Team Blogger Jolie Stekly interviews award-winning author Carolyn Mackler in advance of the upcoming 2013 SCBWI Summer Conference in Los Angeles. 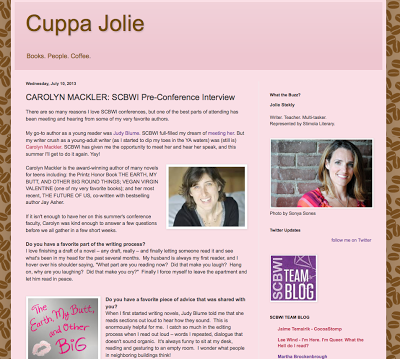 Carolyn shares her favorite part of the writing process (it made me laugh) and even the best piece of advice that was shared with her that she still follows (from Judy Blume!) 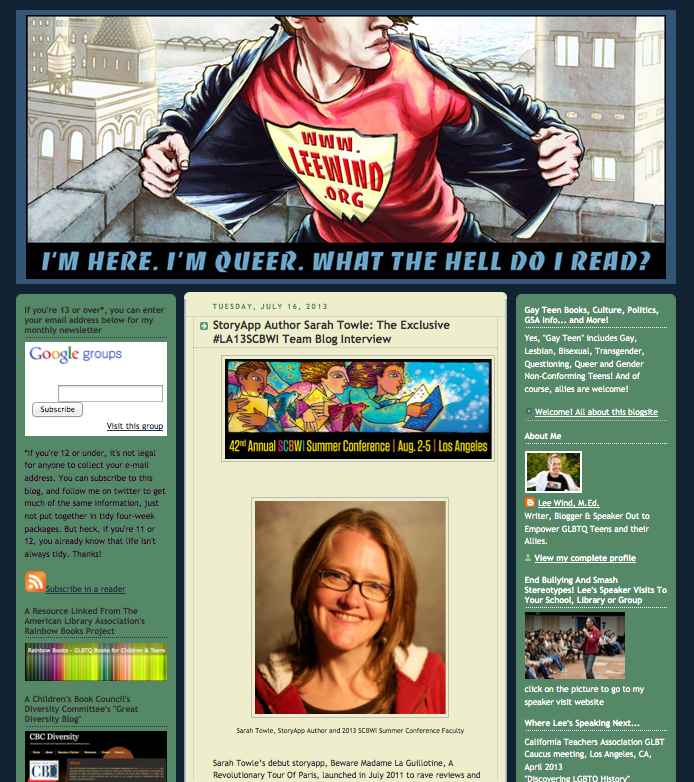 It's a great taste of what we're going to hear when Carolyn gives her Saturday August 3rd conference keynote, "Writing, My Life, and Other Insanely Overwhelming Things." We hope you can join us - the conference is almost sold out and there are only a few spaces left! You can find out more and register here. In the run-up to the summer conference, SCBWI Team Blogger Martha Brockenbrough is interviewing some SCBWI members for their remarkable conference success stories. 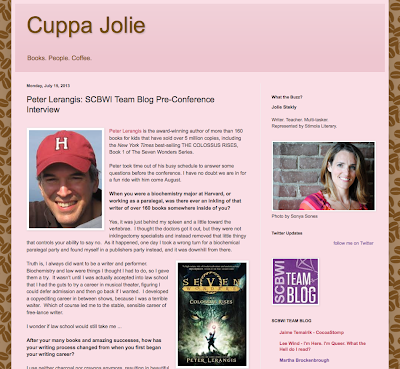 We hope you can join us at the 2013 SCBWI Summer Conference!